Unsaturated-V6 was updated to Unsaturated-V7. Then updated to Unsaturated-Final. Last edited by Eugene.S on Tue Nov 22, 2016 10:41 pm, edited 1 time in total. But, where is the NES Classic Mini palette? Maybe even include, as half a joke, the original 1997 Nesticle palette! It would make puNES, except for nesticle itself, the only other emulator with ballz. A nod to us who grew up with emulators, not real hardware. I was under the impression that any emulator that can run Pilotwings and Super Mario Kart could also run Ballz, and any emulator that can run SD Gundam Gaiden could also run Ball Z. That palette hurts my eyes. Some of the colors are way too bright. Maybe it looked better on CRT monitors. 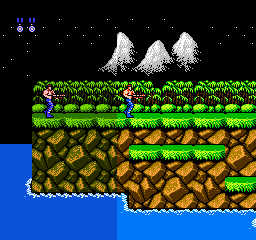 I haven't looked for new NES emulators in over a decade and this one has become my new favourite. The only issue I have with it is that I can't find a way to customize the "working directory" route. I want the emulator to store all its files in a folder I can choose and not in the Documents folder in C:\... Is there a way to do it or can it be implemented? Could the "pixel aspect ratio" option please have 4:3 added? The currently available "possible values": 1:1, 5:4, 8:7, 11:8, provides a close match with 5:4, with the effect of providing a picture aspect ratio of 5:4. That image is slightly too square though, matching the end results of a very old NTSC CRT from the 1950's. The numbers in that list are PAR, not DAR. 8:7 is the correct setting for emulating an NTSC NES. Thanks for the quick response, lidnariq. It is appreciated. Absolutely understood that the settings are PAR; however, there does not appear to be an option to set DAR. By de facto, it appears the visible screen image results in a display aspect ratio equivalent to the pixel aspect ratio setting. Indeed, an NTSC CRT (On average) crops a total of 8 scanlines from the top and bottom. Regardless, if 224 scanlines are present, or 232, 218, etc., as that total may vary between CRT displays, the visible screen image display aspect ratio would not change, just the amount of overscan. Not disputing the correct pixel aspect ratio for a NTSC NES console. Nonetheless, when setting a 8:7 pixel aspect ratio, it translates to the visible image on the screen being only ~14.28% wider than its height. Utilizing the 5:4 pixel aspect ratio, results in the visible screen image being 25% wider than its height. To achieve a 4:3 display aspect ratio, that the vast majority of NTSC users experienced on NTSC CRTs, the visible screen image should be ~33.33% wider than its height. You appear to be neglecting the fact that although the horizontal resolution of the NES is 256 pixels, the actual image output by the PPU includes some horizontal padding (color 0 on NTSC, black on PAL, unevenly distributed between the left and right sides), extending that to (IIRC) 280 pixels. At a PAR of 8:7, those 280 pixels become 320, which divided by 240 scanlines results in the 4:3 aspect ratio you're looking for. Stretching the 256-pixel image further than the 8:7 PAR is just plain wrong. If you want more accurate NTSC video, what you need is for the emulator to draw that horizontal padding before stretching the picture by 8:7, then you'll get your 4:3 window. Multiplying the pixel rate by the scanline length gives 39,375,000*6/4/11*640/(135,000,000/11) = 280 pixels per scanline. The PPU puts signal in 256 of these and a border at the left and right sides. There are two ways to emulate the pixel aspect ratio of the NES: scale before padding and pad before scaling. The NES PPU hardware performs the padding first, adding 24 pixels of border to form a 280x240 pixel picture that can be resized to 320x240, 640x480, or 960x720 square pixels, or to 352x240 or 704x480 if your SDTV output circuit produces non-square pixels at 13.5 MHz (Rec. 601/DVD dot clock, 132/35*colorburst) or 13.423 MHz (PlayStation dot clock, 15/4*colorburst). But as a slight optimization, you can scale first (256 * 8/7 = 292) and then pad: stretch the 256x240 pixels to 292x240, 584x480, 876x720, or 1168x960 square pixels or 320x240 or 640x480 non-square pixels. Then you can emulate the overscan by drawing a TV bezel on top of the edges of the emulated picture"
...would be perfect. Results are a 4:3 display aspect ratio (Window or full screen) for the NTSC NES. hello I am running into an issue on v0.100 and WIP 0.101 64 I can define the increment/decrement slot to a joystick but in use I can only use increment slot, decrement just does not work on the joystick no matter what button it is assigned. keyboard still works as defined. Is there any way of making this work with launchers, like Launchbox, hyperspin, etc? By default, launchbox wants to use nestopia, but I'd rather use PuNES. Seems I need to know the command line stuff to make it able to launch each game. Also, is there a way of mapping the Esc button to close the program instead of alt+Q? Hello, I just wanted to report a bug with a game called Akumajou Special - Boku Dracula-kun (Japan) the English translated version, The English translated rom appears on screen all glitched but the original Japanese Rom works perfect. Thank you and have a nice day.